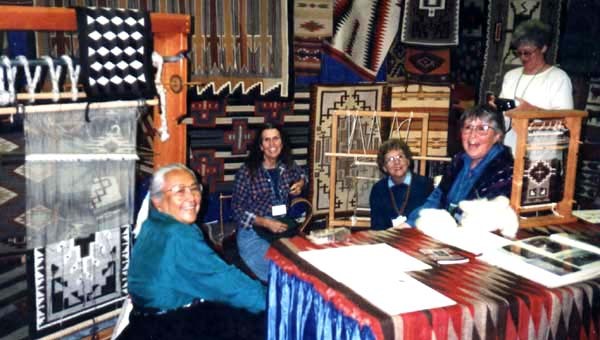 At CNCH Conference in Monterey, CA circa.1984: Sarah Natani near her Two Grey Hills weaving, Barbara Roizen, Marilyn Brandon, Carol Lane near a Miniature weaving, and Bambi Jones with camera. 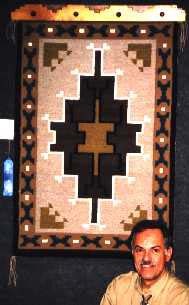 Other members' rugs in the background. 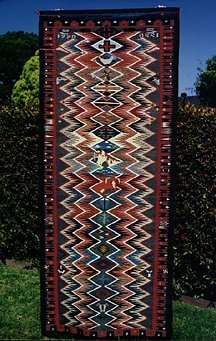 "This was my monumental weaving project taking 15 months to weave (part-time) this detailed 45" x 9' runner. 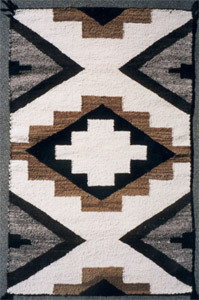 The birth on March 17, 1998 was beautiful and it lays perfectly flat and is perfectly rectangular with straight edges. 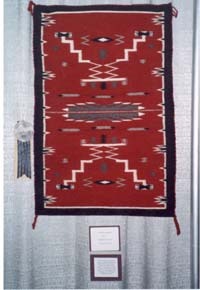 It is my third Navajo-loomed tapestry." 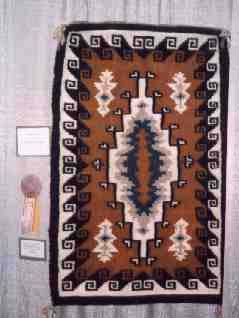 This weaving has a Hereford cow, a Palomino horse, a goat, a black-faced sheep, two chickens and assorted other pictorial elements scattered throughout. It also has both the Big Dipper and Little Dipper woven into it in white and light blue stars,in proper heavenly orientation to each other.